어린이날 was a great day...today was a great day! I met up with my language exchange partner and we kicked it for several hours, it was a lot of fun! I'm realizing that I have a LOT of studying to do and in terms of the Korean language, I've got a hell of a long way to go. We wrote letters to one another then both edited one another's letters and then wrote self introductions, editing, fixing, communicating, vice versa etc. (I realize the earlier sentence is awful grammatically but, it's more of an outloud thought than a proper representation of the English language.) After we went for a walk outside and played billiards. Another thing I have just added to my life list: play a good game of pool...always. After I met up with Kia and Mipa (of Aliens Day Out) at 안국 over in 인사동 for some vegan noms at 바루 (Balwoo Gongyang), located on the 5th floor of the Templestay Information Center. 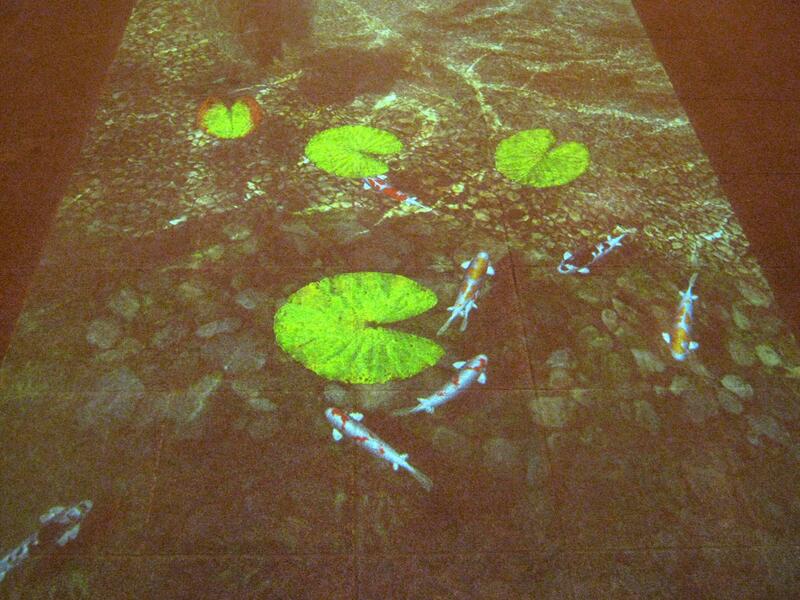 The map on the website doesn't provide a very good sense of it's location, we were on a bit of treasure hunt and more or less accidentally happened upon 바루. When we did enter the resturaunt we were slightly surprised to find a packed place. I was aware that reservations were strongly recommended but considering it was a holiday, I didn't think that many people would be going for some vegan temple food! There were traditional sitting syle rooms or seated tables, we had a room reservation! The room was quaint, clean, and comfortable. There wasn't an array of brihgt clors but soft yellows and warm beige. 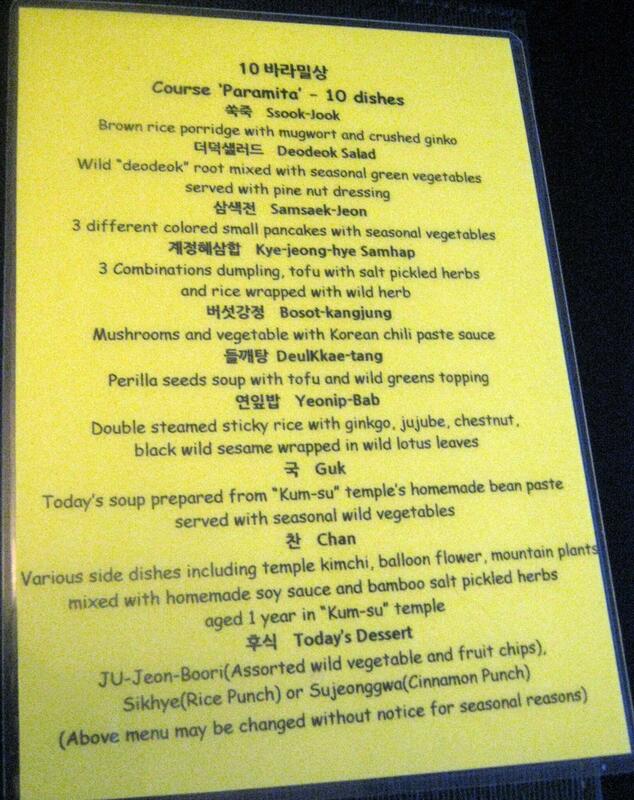 There are three different set menus to choose from at 바루, the 10 dishes Paramita (25,000W), 12 dishes Beopryun Principles (36,000W), and the 15 dishes Enlightenment (53,000W) we all went with the Paramita. 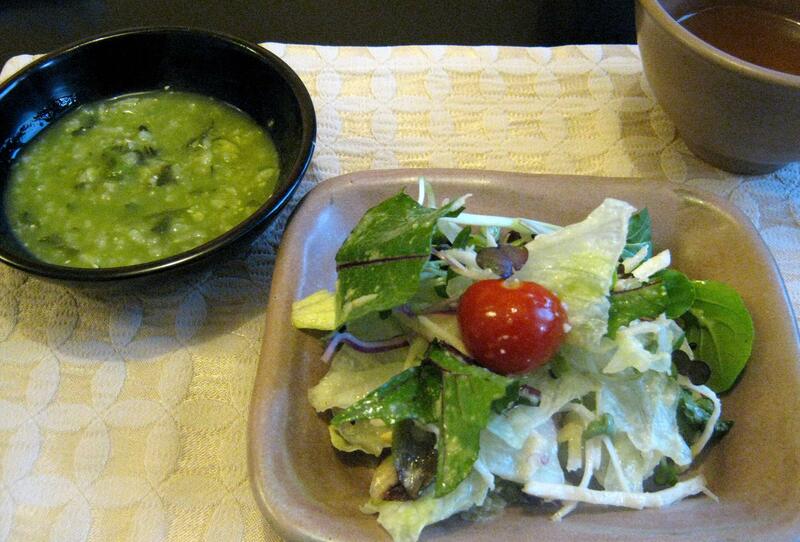 The first two courses were brought out together, (더덕사라드) a colorful salad full of sliced persimons, cherry tomatoes, sprouts, and various lettuces drizzled with a pine nut dressing and (쑥죽) a brown rice porridge with mugworts and crushed ginko. 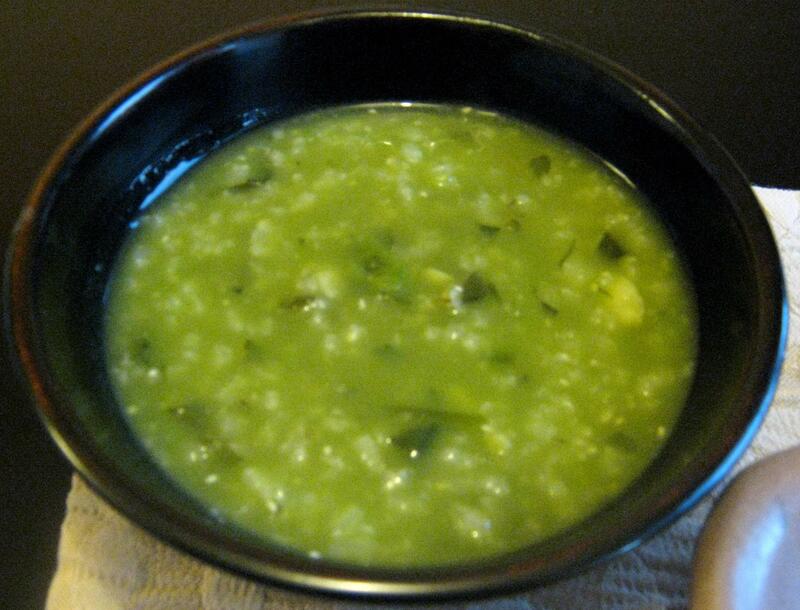 The mugwort and ginko gruel was interesting, there was a minty feel to it and not too overwhelming in flavor. It was more of a clear the palate type of dish. I think it paired well with the salad. 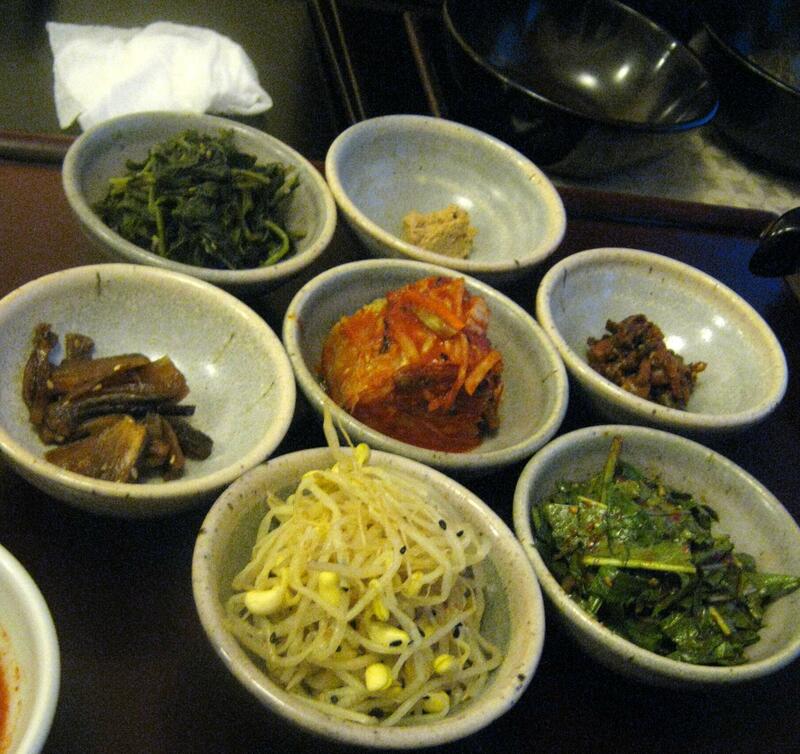 The next course to come was 삼색전, a variety of 전 (jeon or pancakes) I think the types were perilla leaves, squash, and a mixed veggies like carrots, onions, and maybe some soybean. My favorite one was the perilla leaves one, it wasn't too thick and just crispy enough. The perilla leaves flavor was not too overwhelming so the pancake wasn't bitter. They were all really yummy, and it was a little fun trying to decipher the ingredients. 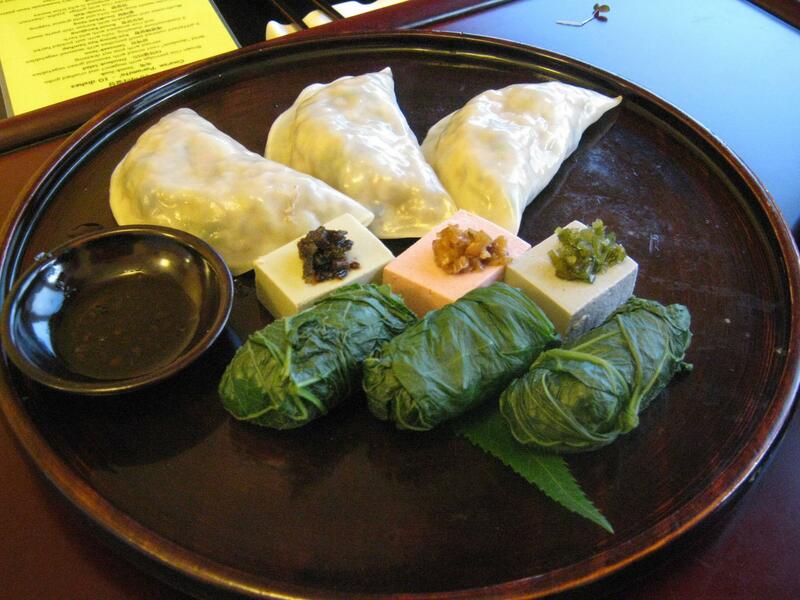 The next course was 계정혜삼합(kye-jeong hye samhap) which was three combinations including dumplings (만두), tofu (두부)with three different salted herbds, and steamed rice3 wrapped in wild mountain herbs. The 두부 was different colors and super cute, but being able to taste all the different salted herbs was a silly challenge. The 두부 was so teeny anyways and our wooden utensils weren't the best for slicing or dicing...but they were all good. The brown salted herbs I liked the best, a little bit like 돤짱, all unique on their own. 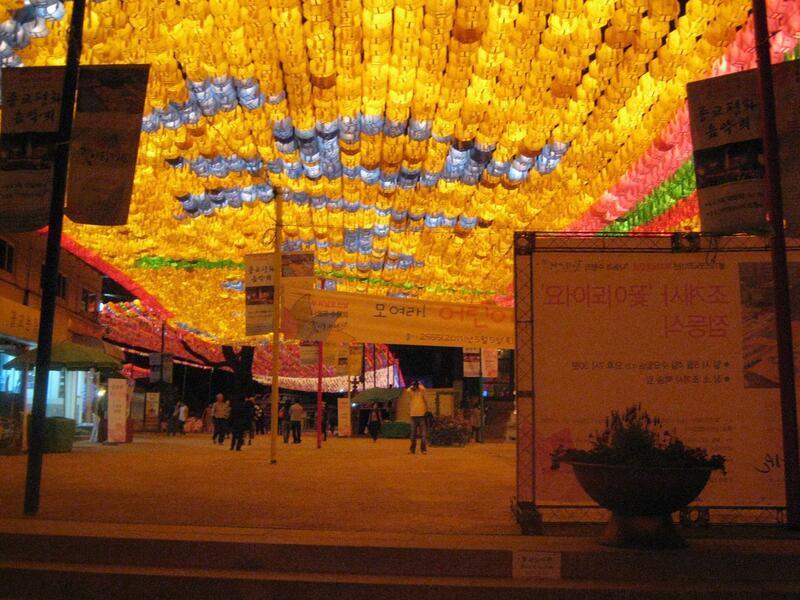 The 만두 was wonderful. Lots of various veggies stuffed into these guys and they were bursting with texture and flavor...yum! The next course was a overwhelming favorite. 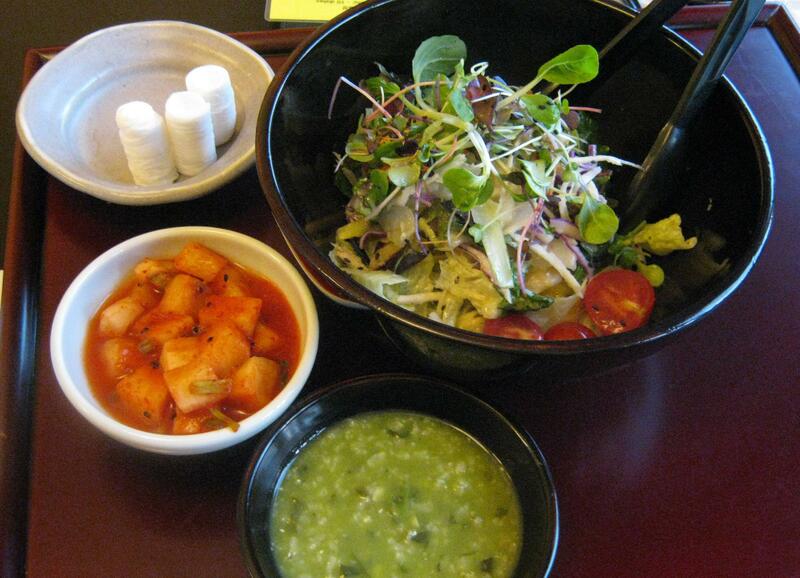 It was the 버섯강정 (bosot kangjung), a lightly fried til cruspy mushroom dish with various peppers and seeds. These mushrooms were covered in a spicey 고추장 like sauce. There was crunch, various textures and a nice heat. 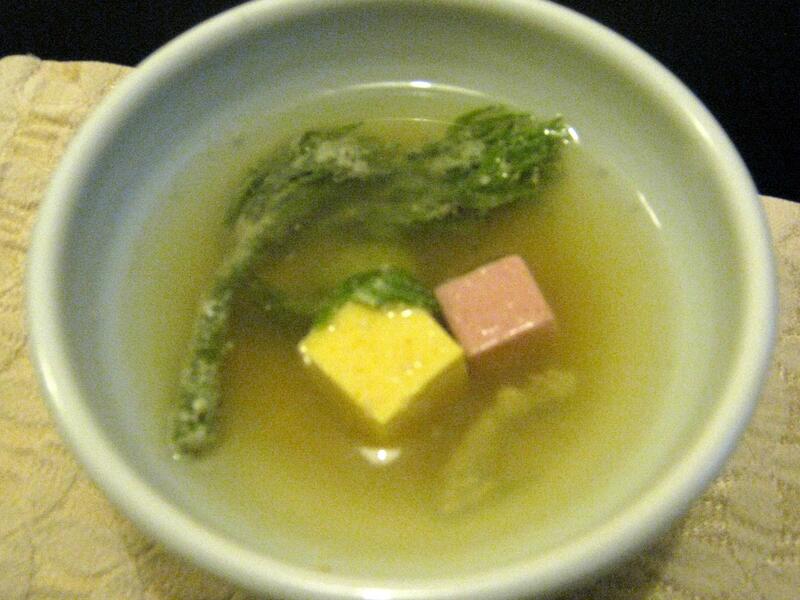 The next course was 들깨탕 (deulkkae tang) a soup of perilla leaves, pastel colored tofu, and wildrgreens. My favorite part of this course were the wild greens. 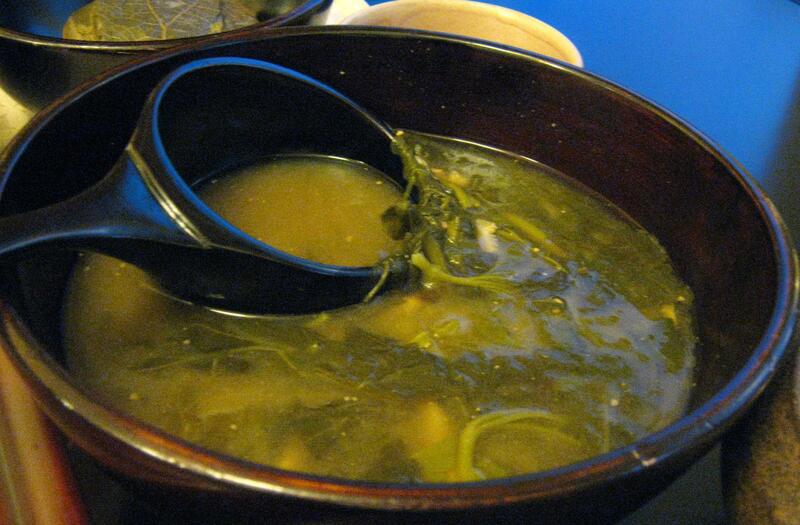 The texture was fun and it sopped up all the beans in the broth and it broke in your mouth like steamed broccoli. The flavor was so slightly sweet it wasn't very detectable but I felt good eating it. 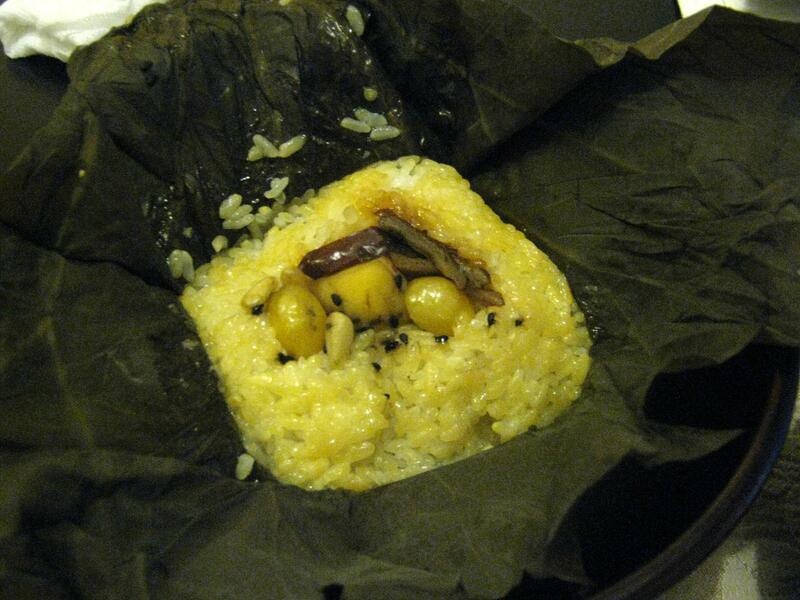 The next dish was like a present, the 연잎밥, double steamed sticky rice with ginko, jujube, chesnuts, and wild black sesame seeds all wrapped in a wild lotus leaf. 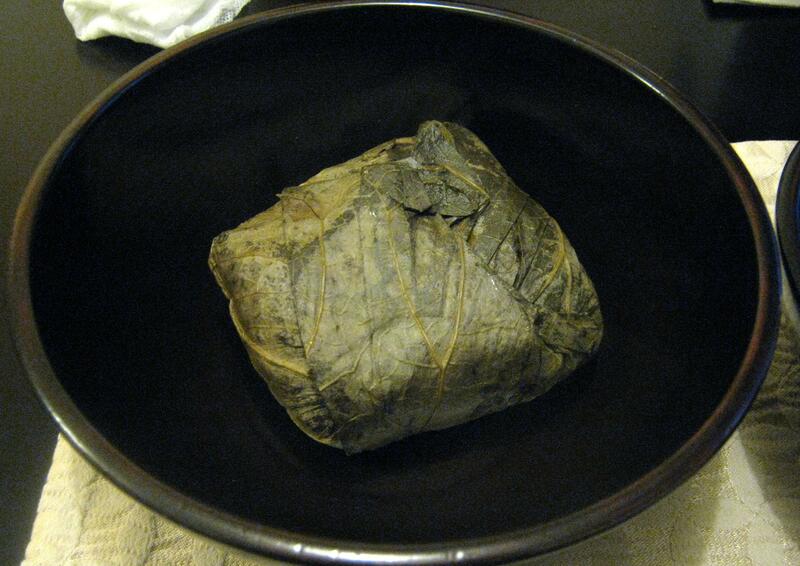 None of us had seen rice wrapped so ornately, I felt like this made this meal feel even more special. Upon opening up our bundles of rice babies, there was a very pleasing presentation of nuts and additions. The rice was yellow in color and there were a bunch of chesnuts (^^*) and it smelt wonderful. I'm not someone to really like rice, at all...but this was wonderful. I didn't finish mine but I did have more rice than I've had since coming to Korea. 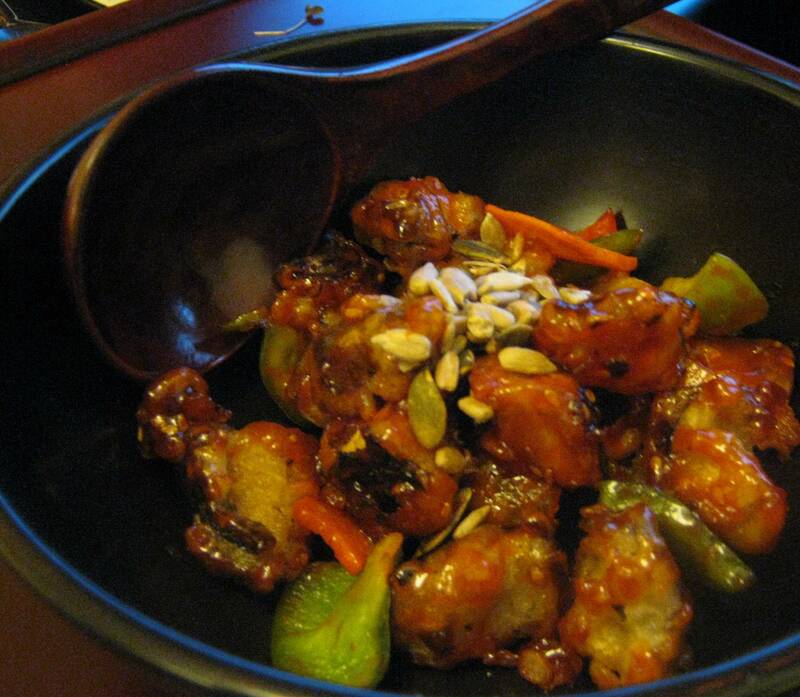 It was full of flavor, sweet, good texture sticky but not gloppy sticky and the ginko nuts were a great suprise!! Whoa, one course left. We were stuffed and definately enjoying our meal and although I was loving all the courses I'm glad they were dwindling down, I don't think I could eat more and still find it enjoyable...The last course was the 후식 which means "today's desserts." We were served 주전부리 and 식혜. 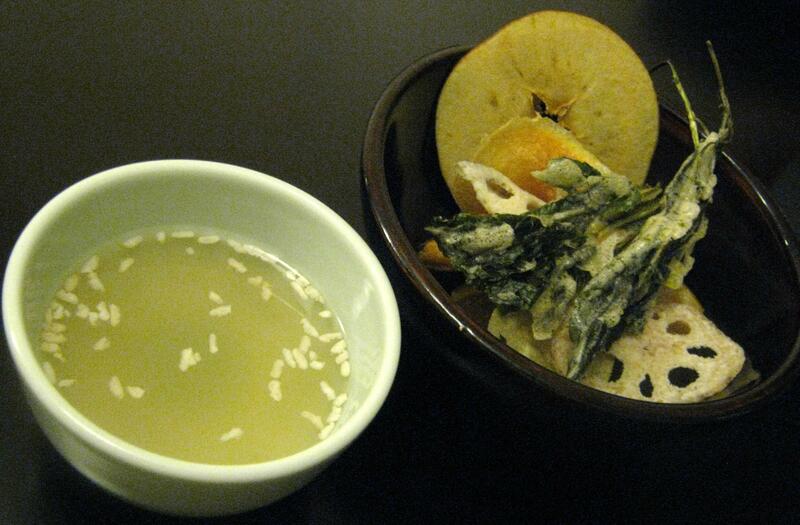 The 주전부리 was a variety of fruit and vegetable chips. 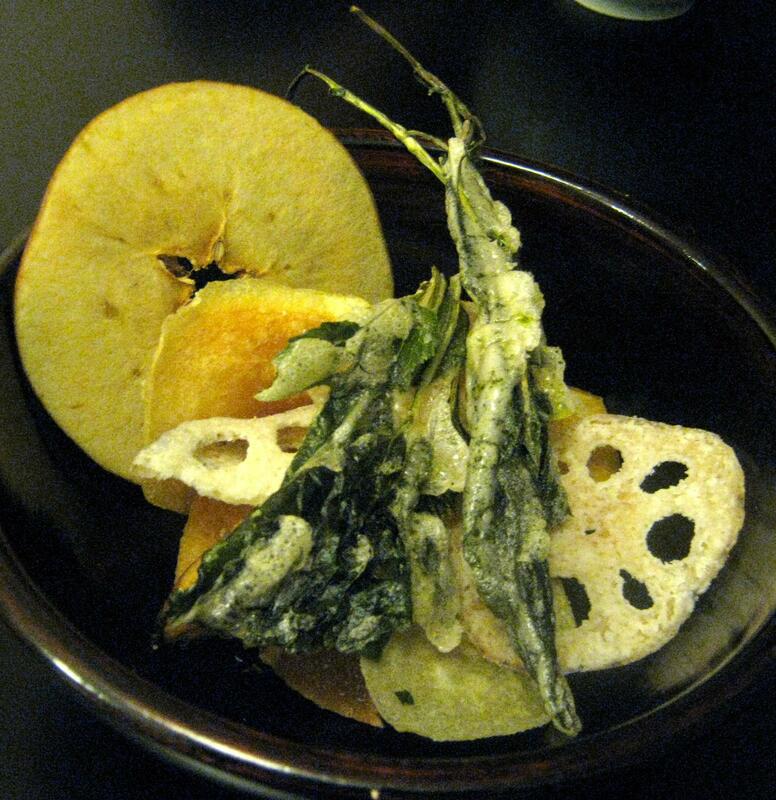 There were mountain roots, lotus root, sweet potatoe, potatoe, an apple, and an orange! The orange chip stole the plate I think, it was so zesty and packed full of flavor. It was a teeny thin chip but when you took in a bit of it, your mouth overflowed with just orange. The 식혜 (sweet rice tea/rice dessert drink) was really wonderful. Sweet but not in that powdered sugar chemically overwhelming way, tasted natural and like it was personally made. After the wonderful meal (yes wonderful) we sat and digested over conversation until the place was closing up. 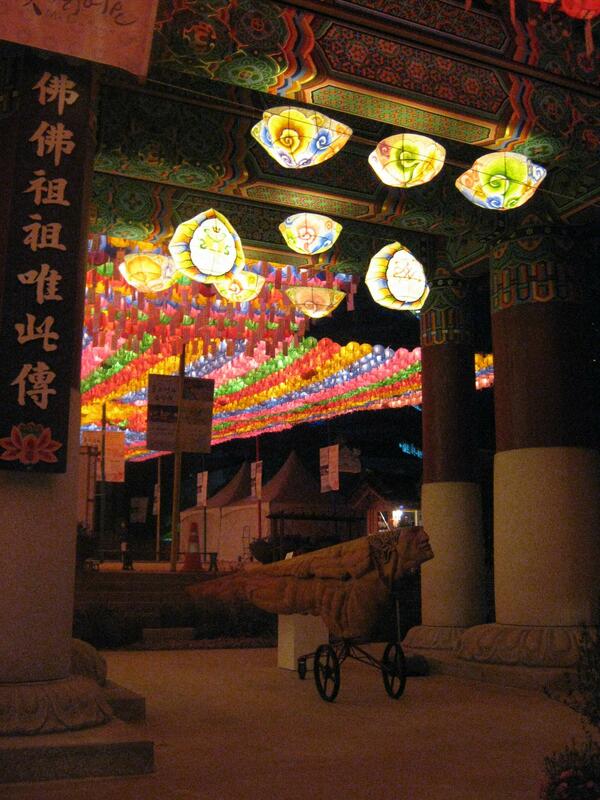 Upon leaving we were welcomed by a temple adorned in lanterns...taking a small walk around we got more than an aesthetically pleasing eyefull. I think 바루 was wonderdful. The courses were gorgeous and everything tasted wonderful. 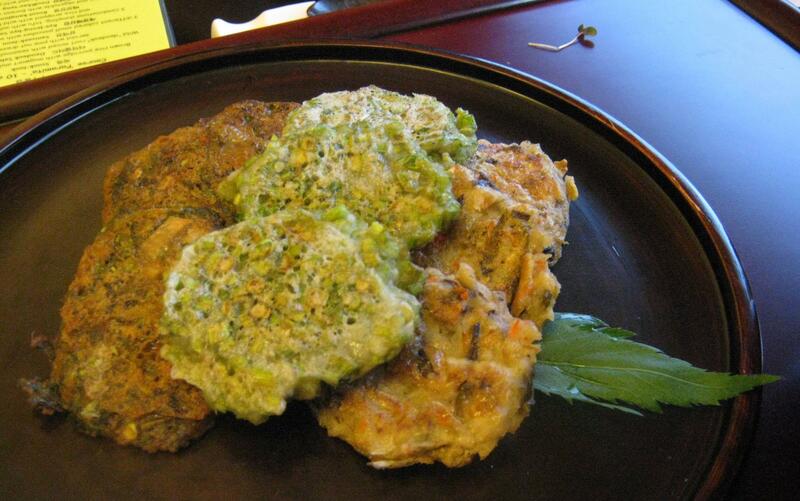 And the portions were just right, not too much, not overwhelming, and the flavors all combined very well. This meal made me feel speical, healthy, good, and overall very pleased. Eating with good people, beautiful Seouls always helps too!! How to get there...ahhh good luck! Make sure to make reservation! !